Our wrist/forearm blaster will help you improve the power and strength in your wrist, hands and forearms. It is perfect for sports like golf, baseball, tennis, wrestling, football, climbing and more. It features a solid steel construction, foam grip handles, and works with standard-size weight plates. Builds strength in wrists and forearms. Weight plates are NOT included in this product. The hanging weight should NOT be more than 20 pounds. 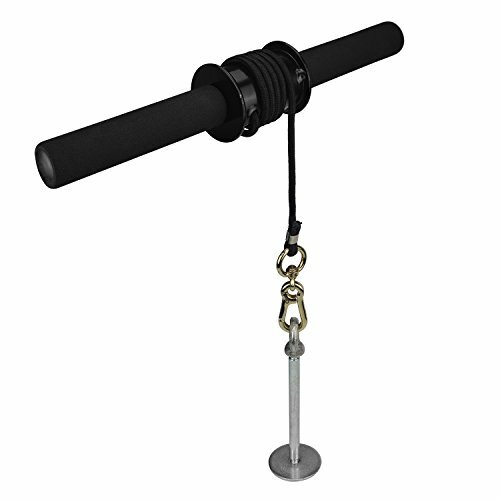 STURDY CONSTRUCTION: Our Wrist Roller is made of heavy duty steel structure to prevent breaking or cracking when used with heavy weight plates. PREMIUM NYLON STRAP: High quality nylon rope strap to add more safety. Weight plates are NOT included in this product. PERFORMANCE IMPROVEMENT: The wrist blaster can help you improve your performance in different activities and sports. By strengthen your wrist, forearms and hands you will have more control, strength and resistance while playing sports. FIT STANDARD WEIGHT PLATES: Our forearm blaster is made to support most standard 1-inch weight plates. NOTE: The hanging weight should NOT be more than 20 pounds. If you have any questions about this product by ActionEliters, contact us by completing and submitting the form below. If you are looking for a specif part number, please include it with your message.